Although “Need for Speed” hit the brakes at the domestic box office with just under $50 million, it was a global hit with over $159 million earned internationally. That bodes well for the video game franchise-turned movie to get a sequel – something star Aaron Paul has said he’d be up for. The actor can currently be seen promoting Xbox One in TV commercials, and he’s now driving the custom Ford Mustang on Blu-ray, DVD and Digital HD in the Need for Speed film. 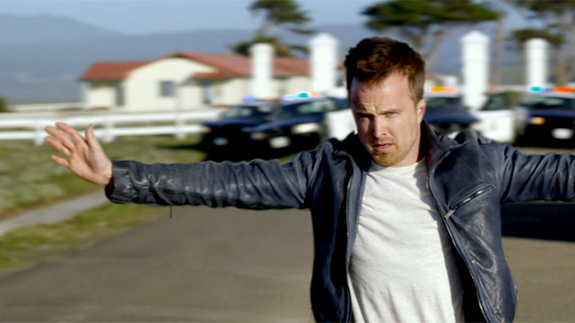 As far as video game adaptations go, “Need for Speed” is worth a rental. The bar’s been set pretty low for video game movies, dating all the way back to “Super Mario Bros.” and “Street Fighter.” The fact that many of the “Need for Speed” films don’t have a plot allowed producer/writer John Gatins (“Real Steel,” “Flight”) to create an original story with Paul’s Tobey Marshall out for revenge against Dominic Cooper’s Dino Brewster, who killed his best friend and framed Paul. Director Scott Waugh (“Act of Valor”) knows how to stage stunts. And there are some interesting making-of featurettes that show how this movie was made. This isn’t a CGI movie like “Fast & Furious.” They actually planned and pulled off the car chases and jumps. The movie offers plenty of thrills in that department, but not even the likable and low-key Paul can propel this racer beyond a rental. There have been a lot worse video game flicks, but it’s simply more fun playing any of the Need for Speed games. Executive producer Stuart Besser talks about the movie, video games and convergence of two entertainment mediums in this exclusive interview. What are the challenges of taking something that started as a videogame and turning into a movie? First and foremost a video game’s value is to simulate an experience that the gamer can play. So it’s not about a storyline or another character that you’re watching. It’s about putting you in the seat, so to speak. The character isn’t as important because you’re that person playing the video game, experiencing that sensation, not somebody else that you’re watching or following. In a movie you certainly want people to experience something, but you’re experiencing it through a character who’s experiencing it, who’s is going through an ordeal or a challenge. The important thing was taking a video game and respecting the spirit of it, the sensation of playing that video game, but creating a story and creating a character that you could get behind and follow and care about. Can you talk about the film’s story, which doesn’t tie into any of the games? With this script we created a character who was something of an underdog, a character with great values who had been wronged and who was getting out of jail and wanted to get revenge. There’s the question of how far is he willing to go to get that revenge. That became a compelling story and a compelling character. That was something we all had to work really hard to create because that wasn’t in the game. What Scott (Waugh) honored from the video game was that sensation that you experience when you play the video game. Scott is somebody who grew up as a stuntman. If you’ve seen Act of Valor, which he also directed, he wanted an immediacy to the experience. He wanted people to feel like they were in the car with Aaron Paul. There was no buffer between you and what was going on. What do you feel actually filming the stunts and sequences added to this film? That required somebody like Scott because of his stunt training, and he was able to bring some of the best stuntmen in the world together to do practical stunts. More and more what you’re finding in Hollywood for a variety of reasons is that many studios and productions are using CGI or green screen. That was something that Scott felt was not appropriate for this kind of movie. He wanted you to feel like that car just did that flip or just went off that ramp over the bridge on to the other side. That’s why we as producers wanted him and that’ the reason why the studio wanted him. We wanted to capture the adrenaline of the game, but we knew that we also needed to create a story and a character that wasn’t in the game. How did you choose the cars that appear in the movie? We looked at which cars were the coolest, which cars were the most beautiful, which cars were going to be the kind of exotic cars that you don’t see unless you’re driving down Rodeo Drive every single day. And they’d be the type of cars you’d want to race in. Did you work with Electronic Arts in getting any of these exotic cars from the game in the film? Yes, we reached out to EA, who had previous relationships with a lot of the manufacturers through the video games. We also had our own relationships, so it was a combination of the two sides working to get those car companies to bring them over so we could film them. How were you able to work with EA to get the Ford Mustang in “Need for Speed Rivals”? It’s really hard to coordinate with a game because the game’s development time is a lot longer than a film’s. We had the director and Aaron Paul and we had a window to make this movie, so we shot it. We wanted to shoot in Mendocino, which is where we started the movie. And we had certain restrictions as to when we could shoot there. Everything came into place and we just went with it. Being able to add the Ford Mustang from the movie – and there were only like six of them made for this production that exist – was something we were able to do later after filming. How was Electronic Arts involved in the production of the film? They were very much involved in the process insofar as having set certain guidelines. For example, they didn’t want a rated R movie and they wanted it set in America. EA has been great partners. They started the whole process of wanting to get a script that could become a movie version of their game. I suspect that they looked at Hasbro with “Transformers,” and maybe some other companies, and thought they should be making a better effort to convert some of their titles into movies that can work. They did a very smart thing by bringing in George and John Gatins. They’re both brothers and George wrote the first few drafts with John’s supervision, and both of those guys really love cars. They buy cars, they sell cars, they know that world really, really well. EA has been a very important part of this whole process. What are your thoughts on the trend of more video game movies? There’s a sense that the video game world and the movie world creatives are trying to bring those two worlds together. A successful movie only helps the video game and the video game success only helps the movie. There is a sense we can get that synergy going. It’s been difficult up until now, but I think in the past not having working on those game movies, I suspect the problem has been, “We have a great title, just jam it in.” They didn’t worry quite so much about the story. The truth is just because I play a video game and love the game doesn’t mean I’m going to see the movie version of it. There are different requirements that a movie has. We focused much more on working with EA in the right way not to alienate the fan base of the game, not to do things that would otherwise not be at least part of the world of the game and making the best movie that we can.